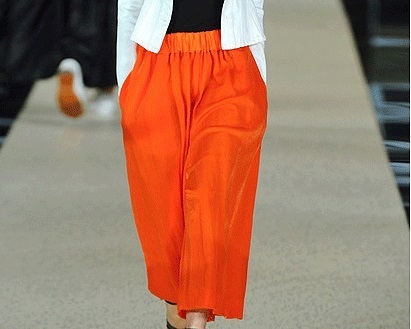 The Culotte is Back – What is Style? Anyone worn Culottes before? I think the last time I wore them was as a teenager when I was in a musical set in the 1960’s. They were a bright, multi-coloured stripe, knee-length, high-waisted and quite tight. (Wasn’t really a good look). Thank goodness they didn’t have an elasticated waist! If you are thinking of buying a pair this season, the key to a good Culotte is to get them the right length on your legs (so they don’t look like baggy basketball shorts) and aren’t too tight. Make sure you pair them with the rights shoes (a decent heel height does wonders). You don’t want your ankles looking fat. For you novices out there, who aren’t sure what they are, they are very wide trousers that give the appearance of a skirt and come in varying lengths. They look to be making a come-back on the fashion scene. I am quite keen on the white one’s by Shona Joy, and also don’t mind the dog-tooth pattern style currently for sale on-line at boohoo.com. A nice alternative to the trousers and perfect for that in-between season. If I am brave enough, will get a photo when trying a pair on. I am trying to be a little more adventurous in my fashion this year, starting of course with my love of the colour orange. I have never suited 3/4’s or capri pants but they have always suited you and as you say, when you find something that suits, you can’t really go wrong. The all important leg length is key if they are to look any good. You and your capri’s are like me and all my pairs of shorts. You can never have too many. Happy days for sure.